Not sure if you can meet anyone who loves senior dogs more than Cathy. 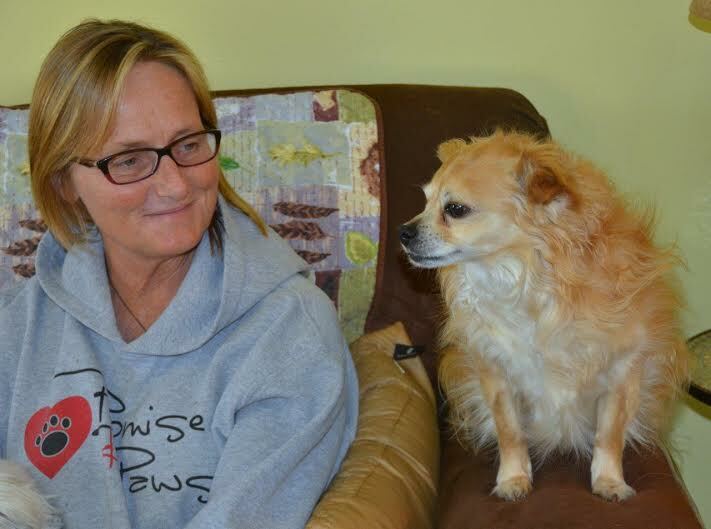 Cathy is one of the co-founders of Promise 4 Paws and has been the go-to person from the beginning. Cathy alone, has fostered and/or foster failed, more times than we can count. 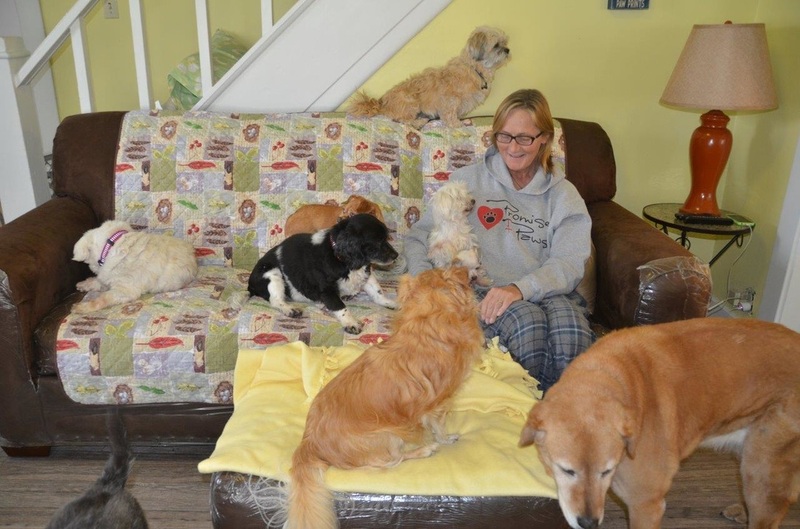 Not only does Cathy stay at the sanctuary, she also has a full time job and eleven dogs to take care of at her own home. One thing we love about Cathy…every night at the sanctuary she goes to every dog’s bed, gets on her hands and knees and kisses each dog head’s goodnight. If you are visiting the sanctuary on a Sunday, there’s a pretty good chance you will meet Tiff and her family. Tiff is also a co-founder of the group. 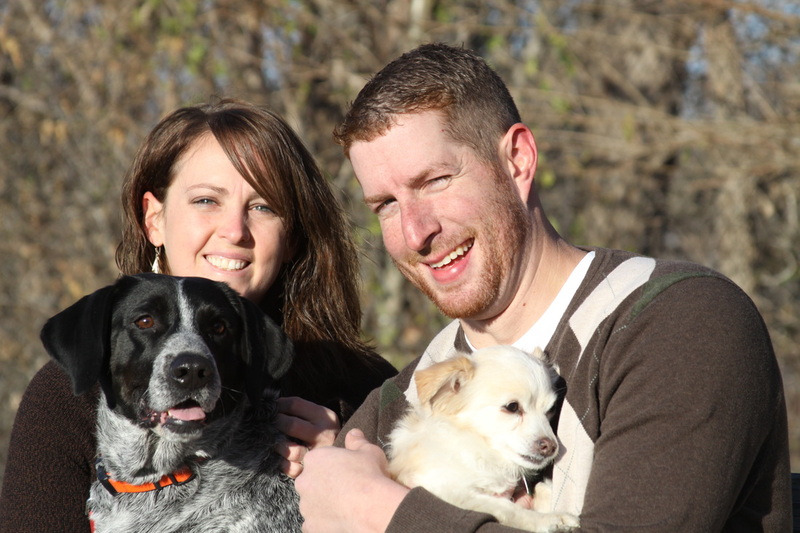 Like Cathy, she has also had several foster dogs come through her home in the past five years. Pictured above on the far left and far right are two foster failures, Max and BJ. In the middle picture is her husband Adam, who is just as much part of the group as Tiff. The pups in the middle picture are their first rescues, Lucy who was a heartworm positive rescue before group started and Via, who was one of the first Promise 4 Paws pulls from the shelter. Not only does Tiff stay at the sanctuary one night a week, she also has a full time job, three dogs of her own, two cats and a four year old son named Mack and an 18 month old daughter named Mara.